Years ago, my Medill colleagues and I launched a hyperlocal news website a bit ahead of its time. When Google released Bulletin, the lessons we learned way back when became relevant again. I whipped up an article on our insights with Rich Gordon, and Nieman Lab picked it up. One angle I would have added is that Google is not trying to become a digital destination like GoSkokie was. It wants to fill hyperlocal content holes and work with local publishers that can’t afford to cover them. In 2004, a team of Medill School of Journalism grad students tried to save democracy, newspapers, and local communities. The threat? The internet. Our response? 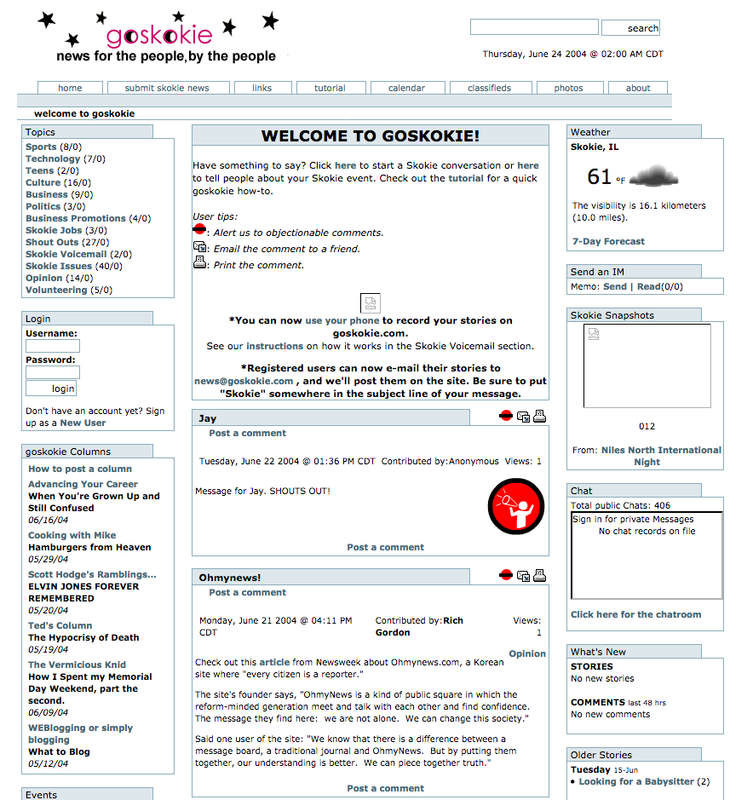 A website called GoSkokie for the people of Skokie, Illinois. Yes, we thought we could use the internet to fix what was wrong with it. But with increasing social isolation, rising partisanship, and newspapers’ ongoing woes, it seems that the problems we hoped to solve with our shuttered project have gotten worse, not better. Perhaps that’s part of the reason why, 14 years after the GoSkokie project, Google recently launched an experiment in local, user-generated storytelling: Bulletin. Google suggested that Bulletin will enable people to “be the voice” of their community by contributing “hyperlocal stories,” but it appears to be struggling with getting people to participate during limited pilots in Oakland, Calif., and Nashville, Tenn. Sounds familiar. We used the term Hyperlocal Citizens’ Media (HLCM) to describe GoSkokie, and we also encountered some of the difficulties Bulletin faces — despite the fact that things were a bit different in the GoSkokie era of 2004. Back then, smartphones weren’t attached to people’s faces, and social media as we now know it didn’t exist yet. Friendster was founded in 2002 and MySpace in 2003; Facebook didn’t launch until 2004, and then only on college campuses. Yet the idea of creating an open publishing platform related to geography remains intriguing. Most people feel strong ties to one or more places — cities, towns or neighborhoods. But most news sites don’t prioritize submissions from the public, and social media platforms hide nuanced local information inside obscure hashtags or private pages. Most average people don’t see themselves as reporters or information providers, so it’s easier to get people to visit a hyperlocal news site than to get them to become content contributors themselves. To maximize participation, offer multiple ways to contribute content. For GoSkokie, besides logging in and writing, users could contribute content via email and by calling a phone number and leaving a voice message. Specific topics — especially those already in the news — generate the most discussion and participation. In the case of GoSkokie, the firing of a high school teacher — covered in the local weekly paper — generated the most discussion on the site. It’s easier to build a discussion (and the potential for community connections) around an issue that is already on people’s radar screens than to conjure one up from nothing. Staff attempts to generate discussion will not work because they will appear to be inauthentic. A site that allows people to submit news items can turn out to be a valuable source of tips for journalists and established publishers. In the case of GoSkokie, one post (about a senior prank at the high school) ultimately turned into a Chicago Tribune story. Commercial messages — people promoting their businesses or using the site in ways similar to classified advertising — may be among the first kinds of content to be submitted. At GoSkokie, we chose to allow those kinds of posts, thinking that they could be of interest to users, but there is a risk that other kinds of content will be crowded out. Government institutions may see an HLCM site as an intrusion, nuisance, or threat because the site can give a voice to people who may not express themselves directly to elected officials. It is also a community forum the government has no control over. In the case of GoSkokie, one response from the village was a threatening letter contending that the topic icon we used for “Skokie issues” violated the trademark for the village logo. Google isn’t using content moderators, but GoSkokie showed how important they were to HLCM. They assured people that the site would not become a haven for vulgar and defamatory posts; served as a point person for working out technical kinks; and provided examples of participation that would inspire other locals to do the same. We never overtly articulated a goal like that when we created GoSkokie, but many of our efforts and lessons learned reflected the importance of putting the community’s needs and preferences above our own. Done right, maybe Bulletin can bring people together and do something truly amazing: help make a world that doesn’t need it. By default, Google creates new office files of any sort inside your main Google Drive folder. If you want to make a new doc or other file in a specific spot, you’ve got to visit that folder in the browser, then create a new document there. I prefer to drag and drop files later and not have the creative process disrupted by organizational needs. Click, go! Then make it tidy. Also, a spreadsheet or document makes it harder to scan the long list of folders in my main Google Drive. Below is a guide that shows you how to use a URL to create a new Google Doc in your preferred folder. One caveat is that if you set Chrome to automatically open default pages, it will interfere with the Automator shortcut for Macs. Use the “Open a new tab page” setting upon startup in your Chrome preferences. You can see that the only part of the URL that is changing is the part that refers to what type of file you’re making — you swap “document” for “spreadsheets” if you want to make a nice big text document to write in. Set the URL of the “Get Specific URLs” action to whatever Google file type you want. If you want to change the app’s icon, right click on it, choose “Get Info” to open a Finder window about it. Find an image online you want for the icon. Copy that image. Go back to the app’s Finder window. Click once on the icon to the left of app’s name. This will highlight it. Then paste the image you copied from the web. The icon should change. Zazing! You’ve got a one-click, tidy method in your dock to make a new Google doc. How can you possibly compete with this absurd cat that is all of us? Not to mention Snapchat stars, well-funded professional journalists at places like The New York Times, 35,000 hours of movies at Netflix, 18.7 billion text messages, the media manipulator in chief, Facebook outrage streams, and Instagram insanity. Easy. 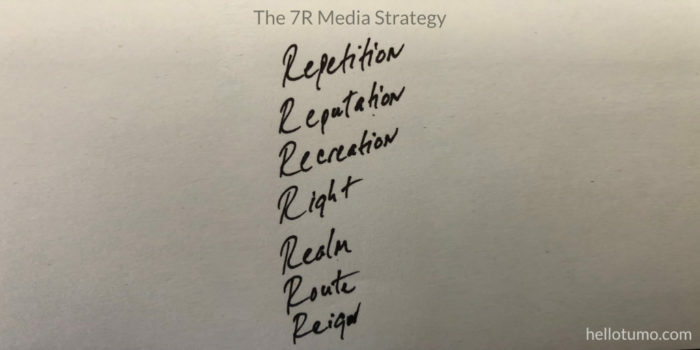 Just use the 7R strategy, a collection of seven principles that make a media project succeed. I learned them over two decades of swimming in the news and working for Stanford SPARQ (where my consulting agreement is approaching its end), The New York Times, SupChina, Spectrum, The Albuquerque Tribune, and others (and pulling together a few movies and books along the way). 1. Repetition: The content needs to be released regularly and often. Curation can address some of this. 2. Reputation: The content needs to be accurate, well-sourced, and reliable. 3. Recreation: The content needs to be entertaining, informative, appropriately short (or long), and helpful. Serve the reader’s needs, not the author’s ego. 4. Right: The content needs to avoid the trap of repeating misinformation in an effort to correct it. Just say what’s right. And present conclusive expertise, not arguments. People need less conflict in the media space, not more. 5. Realm: The content needs to go where people are online. Find them on Facebook and Twitter. Give them apps on their phones. Provide browser extensions. Make software that gives them the ability to layer the lens of your expertise over whatever they’re doing when they’re doing it. 6. Route: Choose the right medium for the message, audience, and resources. GIFs may be popular, but they may not fit every communication scenario. Video can be great, but do you have a budget to do it well? Animation can turn abstract ideas into concrete media experiences, but do you have information that needs its unique capabilities? 7. Reign: Content following these guidelines creates a media destination that lends power and credence to whatever appears within it. People begin seeking out such information providers. As an example, consider how an article’s presence in The New York Times elevates the status of the story. That frame provides power to shift public conversations about important topics. 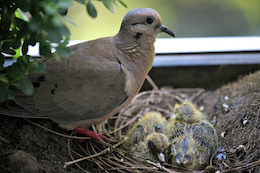 Protect your baby bird WordPress functions inside the warm nest of a plugin. Image via flickr/Alex Proimos. Generic (CC BY-NC 2.0). David Walsh has the secret sauce for getting a link to your post drafts in the posts menu option of your WordPress site. Yes! I built upon his work and created a custom plugin that does the same. Why? Because I hate it when a site update wipes out my functions.php custom code. By using a plugin, you can keep this handy-dandy shortcut secure amid the next upgrade. To do this, just copy the code below into a text file, save it as yourspecialsecretsauce.php, drop it into your plugins directory, and activate it. Description: Adds a link to draft items from the Posts admin menu. Amedeo at hellotumo.com took David's work and made it into a plugin. Jarrod W. Ramos’s first round from his 12-gauge pump-action shotgun broke the glass doors of the Capital Gazette newsroom in Annapolis around 2:40 p.m. on June 28. He came in, moved through the office and kept firing. He murdered five people: Gerald Fischman, Rob Hiaasen, John McNamara, Rebecca Smith and Wendi Winters. I know it was a rejection of the anti-journalist violence he just faced. I wanted to cheer him on. I wanted this defiant commitment to the normal routine of a job amid trauma to do what it intended: comfort him, the survivors, the victims’ families, and all of us left numb and hopeless before yet another gun-fueled slaughter of Americans by Americans. But 17 years after my brother was shot to death, I also know this: sometimes we shouldn’t put out the damn paper. Police: Va. Tech Bloodbath Lasted 9 Min. One Year After Charlottesville: Racism and the White Supremacist Movement in the U.S.
Donating Paid Leave Time to Pregnant Co-Workers Isn’t a Trend. It’s a Travesty. A teacher battling cancer ran out of sick days. School employees showered him with theirs. Worked to Death: The American pension crisis helps corporations maintain a precarious, easily exploitable workforce. The death of the American pension: Shifting the retirement burden from employers to workers has created an enormous financial crisis. Poorer than their parents. What’s gone wrong for this generation? Out of the $2 billion raised through crowdfunding platform GoFundMe between 2010 and early 2016, $930 million was for health-related campaigns. Reading these articles, it seems that whatever has been barely holding us together — or, more accurately, keeping the never-ending social frictions over power beneath the surface — no longer is. Maybe the fact that a generation is going to be worse off than the one before it is straining all the pretty stories of greatness, meritocracy and fairness we’ve told ourselves for decades. Maybe we’re just tired of the ruthless all-against-all spirit of unchecked capitalism. It is exhausting being pushed to treat each other as disposable profit points — seen as worthless unless buying or being bought — rather than inherently valuable human beings. Maybe we don’t see a way to fix systemic racism if we can’t even fix our bridges, our water supply, our schools. Maybe America’s pathological individualism and greed have finally gotten each of us to swallow the story that none of us needs each other. Maybe we have given up and just fallen for the trope about men and women. Maybe we’re just too exhausted with the Puritan mythology that sees work as a highway to heaven, leaving many of us wondering what we are doing wrong to have jobs we like so little and that barely, if at all, provide for our increasingly expensive survival. Maybe we can’t believe that with all our enormous wealth, we refuse to provide health care for one another, somehow failing to see that the health of our neighbors ends up affecting the health of our little individual selves. We don’t seem to care that taking care of each other would make us happier. We don’t seem to care that it would help boost entrepreneurism, that sacred cow of capitalism. Maybe we’d rather burn the house down if there’s no room for us in it anymore. When my brother, Tim, was killed — to this day without explanation or arrest of anyone — I tried to keep to the course of my life as I knew and wanted it. I fought the fact that, for me, the world was no longer the same. I was adamant: I would still be a novelist. Writing fiction still mattered above all else. I would stick to the life structure I had built in New Orleans to turn that tiny dream into a reality. I kept to my routine: 6 a.m. wake-ups, writing for two or three hours, then systematically sending my finished stories to journal editors, then getting ready for the other job at Tulane University, the part-time one that just covered the bills. I lasted a month or two. But it felt like I was watching myself go through the motions. They may have mattered, but I couldn’t feel the meaning. What is a silly short story in the face of the unexplained and violent murder of someone I grew up with and loved? It is everything, I repeated to myself, trying to make it true. But even as I intellectually believed it, I emotionally had left the idea behind. That particular shelter of tenets, rituals, and faith no longer welcomed me. So I did. Or I thought I did. But really I kept on putting out the damn paper. It was just a different one. I started writing more news articles than stories. I got a master’s degree from Northwestern in journalism. I found and ordered facts rather than made up fictions. I did this, I told myself, because I honestly thought that the only way someone could kill another human being was if they lacked awareness of others. I told myself: If someone really had the information to know themselves and others, knew the pressures all of us faced, then they could never pull a trigger, thrust a knife, swing a bat. They would know that our lives are brutal, short, unfair and tenuous. They would see that all of us suffer, that mercy and love and sympathy are the only responses that make sense amid life’s brutal and gentle mortality. Didn’t work. Read those headlines again. Every day, waves of of high-quality facts and stories — from ethically motivated journalists and other information artists — flood the internet. Yet here we are. Hold still. Close your eyes. Breathe. Breathe again. 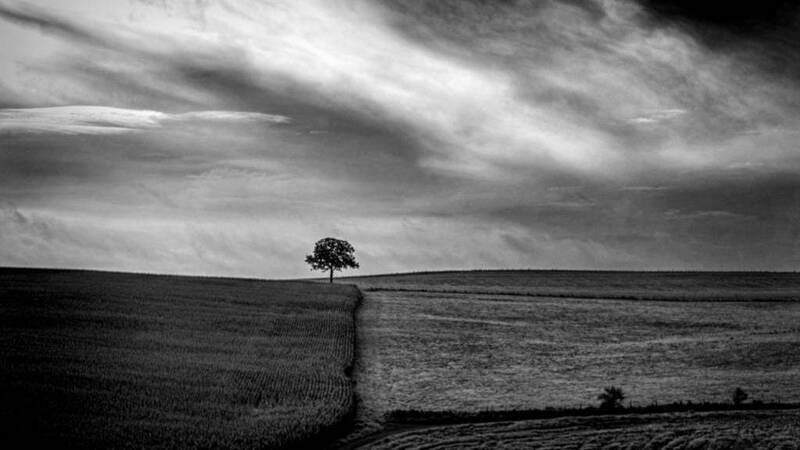 Take a day to feel the contours of the country we’ve become without reacting to them. Just sit with them. Look at them. I know it feels impossible. But try. Try to stop worrying about your own survival for a moment and think about the survival of all of us, of this nation, and how we can ensure it. Americans, don’t put out the damn paper. The day is done. Let it go. The day is done. Thank you. I was not born. I will not die. I do not want enlightenment. Nor do I not not want it. I want to see. Where am I? Here. Where is here? In a room. In a house. In a neighborhood. In a city. In a state. In a nation. On a continent. On the planet Earth. In the Solar System. In the Milky Way. In the universe. In the Mystery. Just 2,640 years ago, Buddha breathed the same air that nurtures me. The universe contracts and expands, breathing as I do. Everything goes to dust and comes back again. Sit with the inexplicable without trying to explain it or putting it into words or images. Just experience it. I am perfect. I accept all of myself. I can now let myself go. “I” is a story. “I” is an instrument to interact with others and guide this momentary life. “I” is not life. One life is a leaf on a tree that is all life. I often say these aloud, focusing on the sound as much as the words. I don’t go on too long, though — just the first minute or two of a sit. You want to be letting go of thoughts, even these. Give them a try. Let me know how it goes in the comments, or share some of your own tips for zooming into the Zen zone. You are alone. You are one with the universe. You are loved. You are hated. You are free. You are enslaved. You are successful. You are a failure. You want. You don’t want. You have won. You have lost. You are alive. You are dead. You are someone. You are no one. You are unique. You are the same. You see. You are blind. You see. Stories were cages. Stories were shelters. Stories were escapes. Stories were water. Stories were anchors. Stories were doors. Stories were bridges. Stories were bridges. Stories were bribes. Stories were masks. Stories were filters. Stories were weapons. Stories were armor. Stories were. Stories will. I took the time to write down 40 things I’ve learned thus far in my short life. I mostly wanted something to make fun of when I’m older — it’s too entertaining to see how our attitudes change over time — but I do hope it transmits a few ideas that I find both existentially helpful and true. My new book also comes with a website, 40by40.xyz. It provides a form to answer this question: What have you learned in 40 years that you know to be true? Whatever people share, I’ll publish on the same site. Maybe another book will come out of it. Have a dream but don’t be a slave to it. Life is bigger than you and your ambitions. Sometimes you need to alter your needs and desires when the world or your own evolving self demand it. We all know that life is change. What’s new is the pace. It’s faster than ever before. 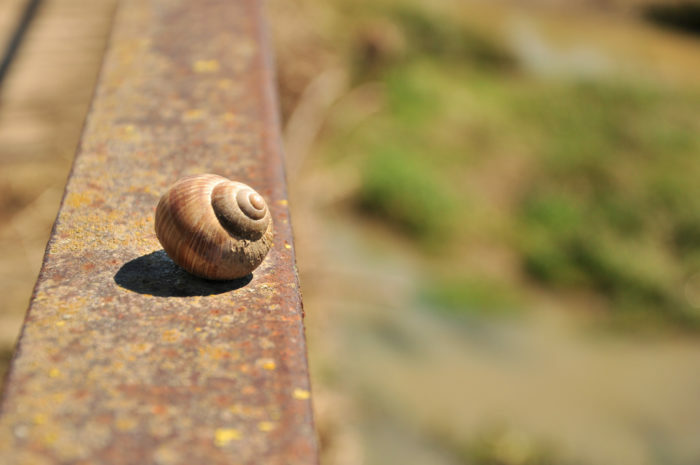 All of those thoughts in our head that create the experience of life from moment to moment — mundane and profound alike — have finally broken past the speed limits of time, distance, and hierarchical power. Blame and credit the internet. There’s never been such a powerful way to gather, consume, judge, and share the concepts that make us human. On top of that, it’s affordable. It fits in your hand. It’s so easy to use, toddlers can operate it. And it makes someone in China as easy to reach as someone next door. People spend hours a day eating up all that content. Professional, amateur, clever, dumb, inspiring, demeaning, destructive — all of it taken in, every second. And it never runs out. More and more keeps coming. You could do nothing but watch, read, and listen to something new the rest of your life with no more effort than reaching into your pocket. That’s different. In the span of a few years, we’ve taken a huge leap in the broader trend of separating human mental activity from the limiting factors of the flesh. Telephones extended our voice; we could chat with someone in real time without having to take a massive trip. Now we have devices extending our voice and bodies, farther than ever before. And we’ve made it amazingly cheap. If I want to hold a face-to-face conversation with someone in Africa, I have myriad choices, many of them effectively free (a basic level of service costs nothing, but, yes, internet connections have a fee, which is remarkably affordable for a certain segment of the human population). Videotelephony has come a long way. The strangest part of this information revolution is the feeling that what’s happening in my head is increasingly disconnected from what’s happening with my body. My concept of “me” may be undergoing a revolution as I engage more facts, stories, and relationships than ever before, but here “I” am, sitting in a chair in front of a desk in New Mexico. A gap is developing. There is a “local me,” made of my body and place and all the limits they entail, and a “virtual me,” an ethereal concept defined by connections to other intangible, mediated ideas pulled from anywhere at all times. It’s disconcerting. Which “me” is the real one? How many of “me” are there, if we define a personality as an intersection of information, tangible and virtual? Are they all real? Which one do I fight for? The “body me” that enjoys American freedoms? The “virtual me” enjoying friendships in Hong Kong? In this environment, it becomes hard for anyone to claim ownership of a particular identity. Culture, once like stone that people were shaped by and shaped themselves into, now pours through and into and out of us like water. If anyone can don an identity by filling their head with the concepts that define it (with less effort than ever before), then a foundation of being human has been remade. Yet in an unstable world, sometimes your (illusory?) definition of “me” is all that holds still. If this too is under threat, there are two responses: fight for your identity, or redefine what it means to be you. The fighters are coming out. It’s what I see in the fascinating arguments about cultural appropriation. I’m not indicating equivalence here, but it seems to be at play at the other end of the ideological spectrum. 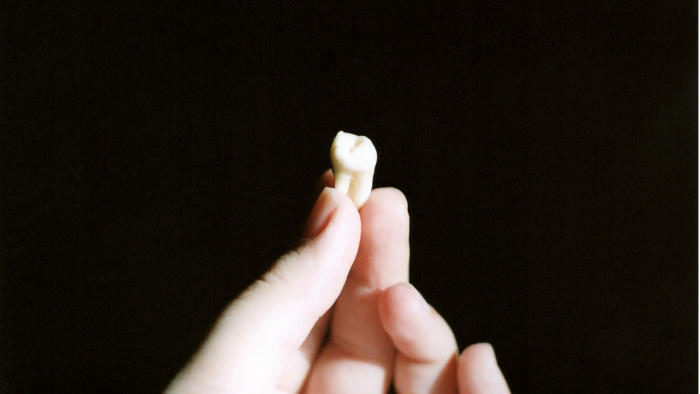 Far, far left, and far, far right hunger for a purity, though for far different reasons. I’d argue that these movements are a search for stability in a technological world that has cut the ties between one’s bodily identity and mental identity. People are trying to bring unity to what technology has sundered. They’re fighting not just for who they are, but for the process society has provided for defining ourselves. I don’t know if they can win. Humans have always pushed to escape the brutal reality of bodily limits. I believe we’re moving toward more fluidity, toward a multitude of “me’s.” Virtual reality will become the norm, and people will wear cultures like clothes; they’ll use their characteristics like tools to elicit certain responses from those they communicate with. “Me” will become a functional choice. Identity will be a quickly shifting network. 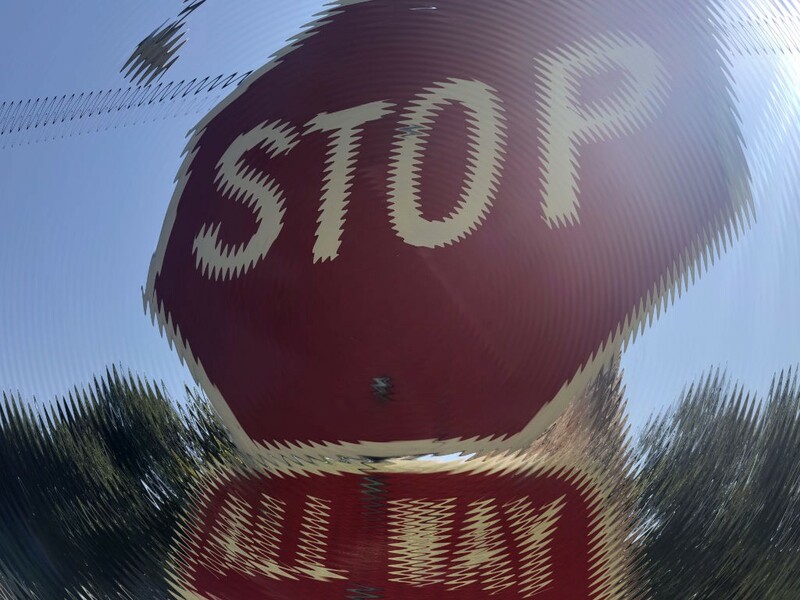 Way, way ahead, I imagine consciousness completely separating from our bodies. It will travel to where it’s needed or desired, free and ghostly as light.